As a spiritual healer, my main aim when I started serious Tarot studies in my early 30’s (about 12 years ago), was to learn how to use them for healing. Having studied Psychology and aspects of vibrational medicine, I knew there was unlocked healing potential in these 78 keys to Self… so I started digging. 1. Meditate and journey with the card image. The Tarot is a visual medium that opens a gate to our subconscious mind because of its use of archetypes and symbols. Whether you have studied the Tarot or not, the image itself will tell you what you need to know right here and now. Go somewhere quiet, where you can have at least 20-30 minutes undisturbed. Light a candle and some incense to let your subconscious mind and Higher Self know that you are ready to receive their messages. Simply spend a minute looking at your chosen card and try to relax while doing so. If there is any tension left, take three deep breaths and close your eyes… Step into the card… visualise the surroundings depicted in the card and enter into dialogue with the main character in the card. Ask what message they have for you. When you are ready, come back to your body by taking another couple of deep breaths and open your eyes. First method: spread the cards out face up and choose the card that speaks to you most strongly. Second method: shuffle the cards and fan them out face down. Allow your intuition to guide you and pick one card to turn over. For both methods it is good to make a note in your Holistic Change journal about your initial reaction or why you felt drawn to that particular card before you begin your meditation. Complete the meditation session by make another note about what transpired during your meditation and what insights you gained. 2. Make a Tarot Essence. 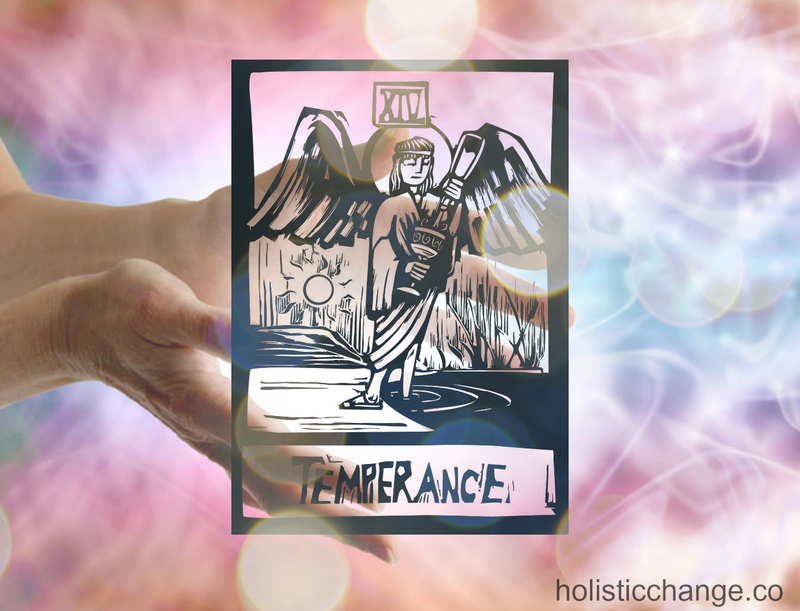 Just like you can make vibrational remedies with flowers and crystals (or even just a word taped onto a water jug according to Dr Emoto), you can create remedies with your Tarot card of choice. The first method is to fill a glass with pure spring water (or filtered tap water – make sure to use a reverse osmosis filter if you have fluoride added to your local drinking water) and place it directly over the card for a minimum of 15 minutes. Just 15 minutes is enough if the essence is charged by direct sunlight. Other conditions usually require a longer period of time – allow your intuition to guide you. Feel free to put a clear quartz crystal (or a crystal corresponding to the card energy) in the glass for programming at the same time. The second method is to place the tarot card in a glass (or jar) inside a larger container filled with spring water (or filtered tap water). Again, you need to let the water absorb the card energy for at least 15 minutes before drinking it. This method is ideal if you are creating an essence for more than one person. 3. Place the card directly on your body/chakras. This method combines the meditation method with an element of vibrational medicine. Depending on which part of the body you are working with, you can either sit or lie down. If you prefer to sit (due to falling asleep to easily when lying down) you can tie the card in place with a scarf. Please note that this will not work everywhere on the body for obvious reasons and depending on the size of the cards you are using. You may want to choose a small-ish cards for placing over the throat chakra for instance. Allow time for really listening to how your body receives the energy from the card. Don’t forget to make a journal entry after! 4. Divine with the Tarot cards to heal your chakras. I have created a FREE instructional Chakra Healing with the Tarot video series for this HERE. This method demands a willingness to face your Shadow in a awareness and is quite demanding of your time/energy but well worth it! 5. Use Tarot-related stances/yoga poses. Each of the Major Arcana cards have a stance associated with them that unlocks the energy of that card and helps you absorb it and charge up really quickly.